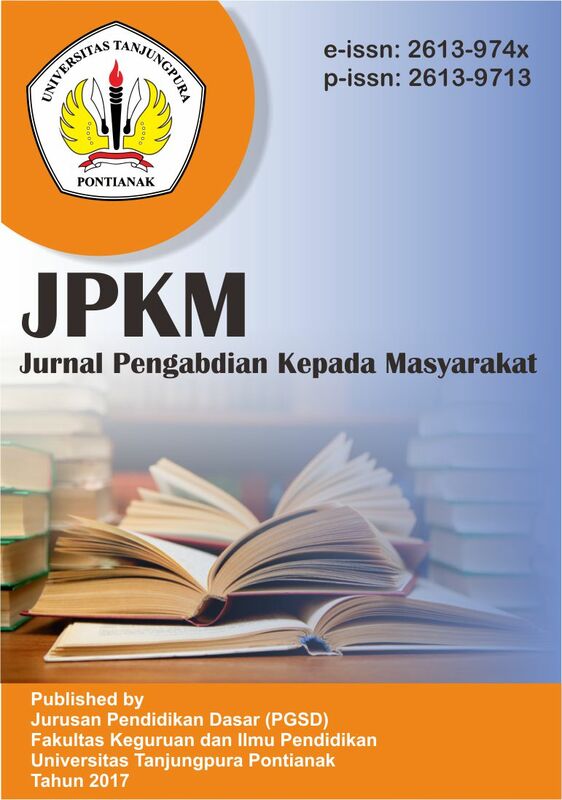 Jurnal Pengabdian Kepada Masyarakat (JPKM) is a scientific multidisciplinary journal published by PGSD FKIP UniversitasTanjungpura. It is in the national level that covers a lot of common problems or issues related to community services. The aim of this journal publication is to disseminate the conceptual thoughts or ideas and research results that have been achieved in the area of community services. Jurnal Pengabdian Kepada Masyarakat (JPKM), contains various activities of researchers in handling and managing the various potentials, obstacles, challenges, and problems that exist in society. Implementation of service activities also involves the participation of the community and partners. Service activities are organized into an activity aimed at improving the welfare of society. Jurnal Penelitian Pendidikan Dasar (JP2D) is a Research Scientific Journal published three times a year in January, May and October. The article contains the results of research and other scientific literature related to education, learning, science, technology, socio-culture, and entrepreneurship, especially related to Basic Education in order to inspire and provide benefits for the wider community.